Founded by former coffee executive Emilio Baltodano just over a year ago, Eleva focuses on sustainability and affordability, working with farmers in places like Ethiopia, Nicaragua, and Guatemala to source coffee directly, which is then sent to New York, roasted there, and placed in biodegradable packaging. They claim to pay farmers higher-than-average wages, and partake in outreach efforts in the areas that grow their coffee, such as making repairs to local schools. 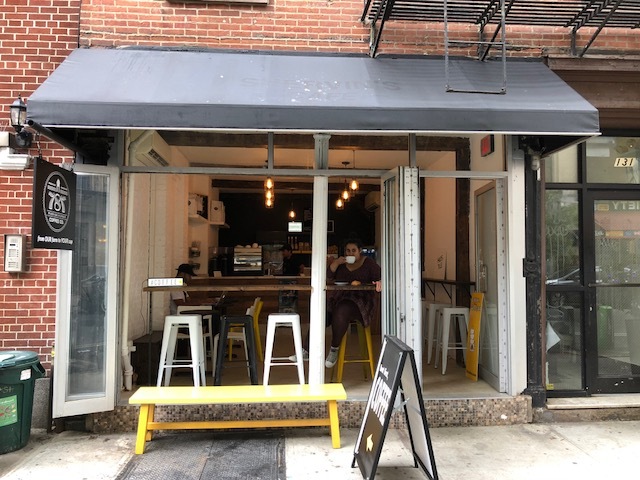 Eleva’s first “coffee bar” is located at 178 North 8th Street, making them neighbors to Pearl’s, a Caribbean restaurant from the team behind Sweet Chick, and its adjoining cocktail bar Clyde’s. It will be a “cozy grab and go style” spot, as opposed to other nearby cafes that host hordes of Wi-Fi-loving freelancers. Painted murals on the cafe’s walls will show the countries Eleva sources their coffee from as well as explain their “three pronged social impact initiative” aimed at farmers and their communities. True to their sustainable roots, packaging at the coffee bar will be compostable and recyclable. 787 Coffee formerly maintained outposts on Mulberry Street as part of The Market NYC, and inside Soho’s Broadway Market Co., another location of The Market NYC. EV Grieve first reported in August that the Puerto Rican company would be opening a shop on 131 East 7th Street, off Avenue A. Touting similarly sustainable values, 787 grows, processes, and roasts their coffee, all on a chemical-free farm atop a mountain in Puerto Rico, with the goal of restoring the island’s coffee crop to the level of success it previously enjoyed. This East Village location will be their flagship, and a rep tells Bedford + Bowery they hope to open more locations down the line. And if you like the coffee you’ve bought so much you want to sign up for a subscription box of it, both can be accomplished at these new cafes, so you can have caffeine flowing through your veins no matter where you are. Eleva will even be offering a special price for those willing to pick up their subscription in person. Eleva Coffee Bar, located at 178 North 8th Street, will be opening later this week. 787 Coffee is located at 131 East 7th Street, and is open as of today.